This book, being a straightforward trade children’s book is a different thing completely from the special and wonderful books I have included before in this mini-series but anyone who has read our Bibliography or heard us speak will know much I love it and how strongly it influenced my decades as a book builder. I see that it was published in the year I was born and I was given my copy quite soon afterwards. 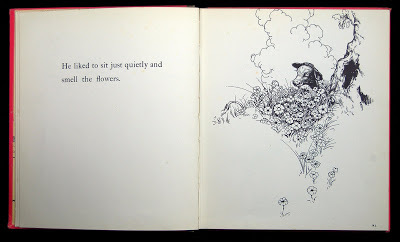 It was certainly a book that was read to me so that my eyes and my imagination were able to range freely across the landscapes on these pages and how much I loved doing that. I was captivated by the warmth and humour of the black and white drawings but I suppose it must have been unconsciously that I so valued the great areas of white space within them which added so much to their power rather than the reverse. 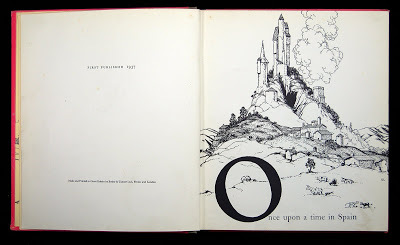 I was always especially fascinated by the great “O” on the initial page. I can vividly remember, without being able to explain it, my childish delight and love of this great sculptural shape which seemed to stand both as part of the line of text but also as part of the landscape – so drawing them together, I suppose. This is not the place to recount the story in detail. 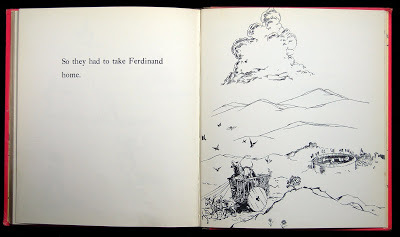 If you have come across Ferdinand, you will know it off by heart and, if you have not, I can only hope that you can find a copy for yourselves. 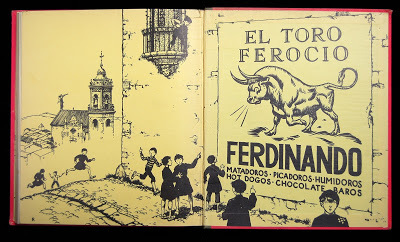 Suffice to say that Ferdinand is a little bull in Spain. In his field there are other child and adolescent bulls who love to rag around and fight each other and dream of being chosen for the bull-fight in Madrid. 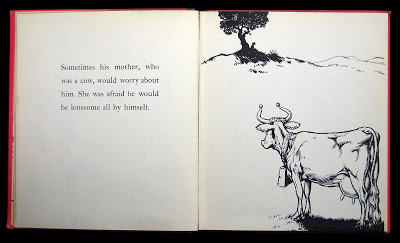 Ferdinand did not have any desire for this sort of behaviour but spent his time sitting under his favourite cork tree ‘just smelling the flowers’. 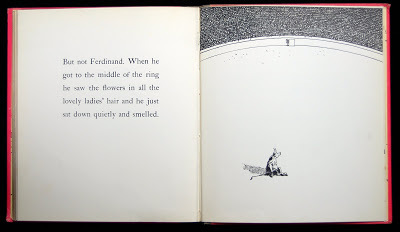 At a very early age I realized that I WAS Ferdinand . . . going off by myself rather than rushing round with the others! 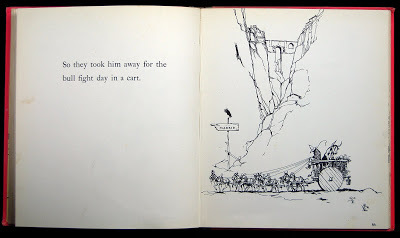 That was the other reason for my love of this book but, for the moment I would just like to offer you some more of these incomparable drawings. 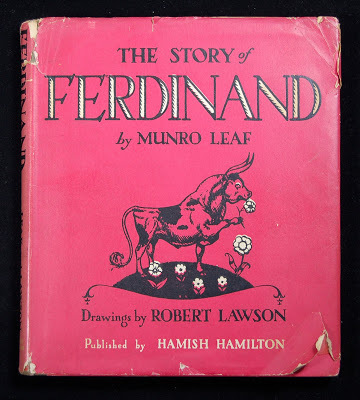 When the talent scouts arrive, Ferdinand goes off to his tree but unfortunately sits on a bee and is stung into great snortings and leapings about. The talent scouts immediately think he is the strongest and fiercest bull of all . . . In the bull-ring, all the matadors and the picadors and so on march proudly round . . .
. . . and he ends up happily under his cork tree! Bliss. I end with the wonderful endpaper drawing. This is the Spain that I have always looked for and how we laughed every time at the linguistic naughtiness of ‘hot dogos’ and ‘chocolate baros’!